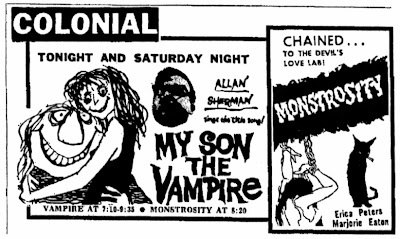 This offbeat horror double bill rolled into Lebanon, PA on December 20, 1963. MOTHER RILEY MEETS THE VAMPIRE (1952) was the last of 16 British comedies featuring Arthur Lucan as his popular drag character, elderly Mrs. Riley. Despite the presence of co-star Bela Lugosi as a vampire named Van Housen, it took another 10 years for this movie to reach the U.S. 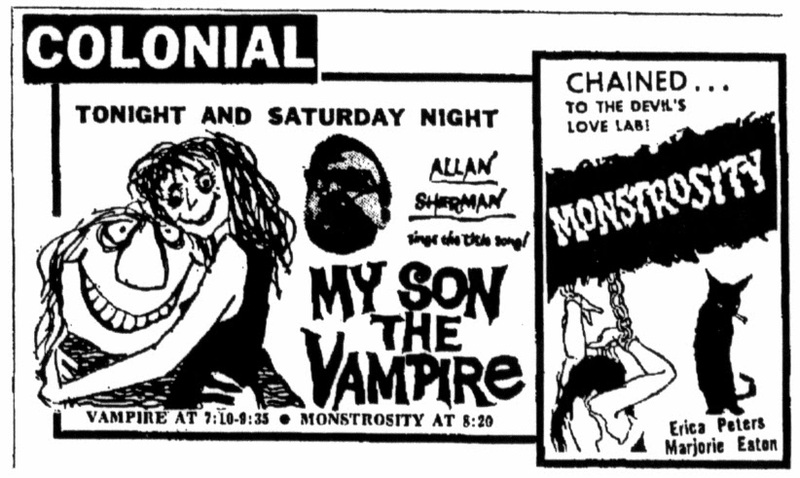 Under the title MY SON THE VAMPIRE (1963), it featured a new pre-credit sequence and song by Allan Sherman, whose comedy LP My Son, the Nut -- featuring the Grammy Award-winning single "Hello Muddah, Hello Faddah" -- had been at the top of the Billboard charts for two months prior to the film's release, and eventually sold over 1.2 million copies. The co-feature is better known as THE ATOMIC BRAIN thanks to late-night TV showings (beginning in 1967) and Mystery Science Theatre 3000, although Something Weird Video did issue it on a triple feature DVD with LOVE AFTER DEATH (1968) and THE INCREDIBLE PETRIFIED WORLD (1957).